A huge thanks must go out to all those who attended the 2016 conference and made it such a success. The feedback we have received has been great and we are already working on plans to deliver a bigger and better conference in 2017. The below article offers a summary of the content presented at the conference and links to the presentations and audio files. Dave Haskins commented on the progress made on BRT in the UK since the founding of BRT UK eleven years ago, noting that prior to 2005 little thought was given to BRT in this country. Dave reminded the conference that sometimes it is harder to measure progress on an annual basis, but when we take a longer view the growth of BRT is abundantly clear. Dave closed by inviting members to take a more active role in BRT UK. Councillor Fender observed that there had been small-scale interventions on the Oxford Road to support bikes and buses since the early 1990s, but it was only when TfGM looked at the whole corridor that the piecemeal approach was abandoned in favour of comprehensive improvements. He outlined recent progress in transport infrastructure in Manchester: the Second City Crossing for Metrolink will be completed in 2017 and the system carries 36 million passengers per year, while the recently opened Leigh-Salford busway carries 50,000 passengers per week. Councillor Fender argued that bus franchising will allow TfGN to extend the benefits of better transport even more broadly since 80% of transport journeys are by bus. Bus franchising will help to grow bus patronage by enabling the creation of a coherent brand, integrated ticketing and replacing on-road competition with co-operation. Anthony Murden explained that bus priority schemes accounted for £122 million of the £1.5 billion Greater Manchester Transport Fund. The key objective of bus priority schemes is to promote economic growth. TfGM is working on 40km of bus priority improvements focused on three corridors. The northern corridor stretches to Middleton is the most constrained. The western corridor to Leigh and Atherton has significant priority and the guided busway. The southern corridor has one mile of highway reserved for buses and taxis. Antony observed that huge progress had been made in the last year. The guided busway is improving the residential appeal of the corridor. David Budd discussed the delivery of the Oxford Road Corridor scheme. The conditions for delivering bus priority on the corridor were challenging in light of the diverse stakeholder landscape and the high number of bus, pedestrian and cycling movements (there are 1.6 buses per minute in each direction). 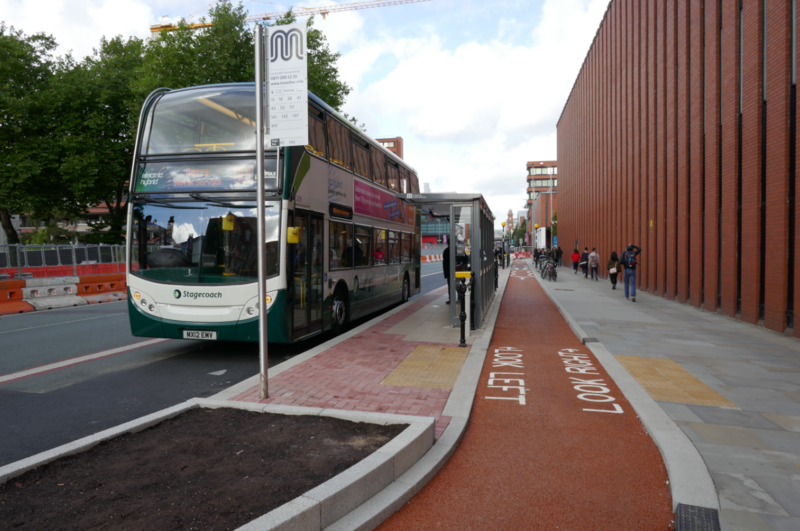 The scheme entailed implementing a bus gate at Moss Lane East, reducing the width of the highway from four lanes to two lanes, changing the speed limit to 20mph, building segregated cycling lanes and changing access arrangements. Bus stops were redesigned to accommodate cycle lanes. Neighbouring roads were widened to compensate for lost capacity. There was a need to secure support from a diverse range of stakeholders. TfGM worked with Corridor Manchester a group of high profile stakeholders including educational, cultural and healthcare institutions, landowners and developers. TfGM was a single point of contact for all stakeholder management. Several TROs were needed to deliver the scheme, but TfGM wanted to avoid a public inquiry to save time and money. To secure stakeholder buy-in, TfGM conducted a full audit of the entire route, speaking to all residents and businesses to identify unforeseen needs and concerns. Feedback from local stakeholders was fed into the design process to create a series of service loops. In response to concerns voiced by the private hire lobby, the access restrictions were modified from 24 hours to 6am to 9pm. The result was that few objections were received and a public inquiry was avoided. TfGM implemented a comprehensive communication strategy which incorporated video, maps, posters on vans, social media and an educational tool explaining how to use the new infrastructure. A cycle counter serves as a useful promotional tool to demonstrate the popularity of this mode. Construction was co-ordinated so that the delivery of the scheme was combined with a full refresh of the highway. Construction was planned to coincide with quieter periods (though there are few of these on the corridor). There was some transfer of the scope of the scheme via Section 278 agreements to private developers working on sites on the corridor. Martin described the successful performance of the Leigh-Salford-Manchester Bus Corridor. TfGM specified the level of service as part of the package. There are four buses per hour on each of the branches and eight buses per hour on the main spine of the corridor. First’s Network fares apply on the corridor. Peak delay formerly added 20 to 30 minutes onto journey times. This has been reduced so that journey times to Leigh are now 50 minutes. First operate buses on the corridor, using high specification Vantage buses. There are 45,000 to 50,000 passengers per week. Passenger feedback has been positive with 98% user satisfaction. 73% of passengers live within 1km of the corridor with the remainder living over 1km from the corridor. 20% of passengers are former solo car users. Criticisms have been limited to relatively minor issues such as the WiFi allowance. The terminus of the route will be extended to Central Manchester Hospitals, which will be managed to minimise the potential patronage losses. There is spare capacity on the busway so other services could use it. There was discussion as to whether the bus stops on Oxford Road could be used by different bus types in light of future need to upgrade to a higher capacity bus fleet. Several delegates asked questions about the delivery model for the Leigh-Salford busway. How was the public sector able to determine levels of service? Was a TWAO required? Manchester City Council, the highway authority, owns the asset which allows TfGM to specify the service in the deregulated market. TfGM did not choose to use a competitive tender process: instead, it develop a service specification and then looked at what operators could offer, before selecting First. There was debate over the value of the guideway in the Leigh-Salford corridor scheme. Is it a political expedient? TfGM believes the busway offers economic benefits because it allows for a narrower route. The Belfast Rapid Transit scheme is being delivered in-house by the Department of Infrastructure in Northern Ireland and is due to open in 2018. This is an entirely on-street BRT scheme. At £90 million, it is a flagship scheme for the Northern Ireland Executive. Alan noted that Northern Ireland has a regulated bus market. Phase 1 of the scheme included three routes, which form cross-city services so vehicles do not terminate in the city centre. There will be procurement of new, multi-door vehicles and off-board ticketing. The scheme entails a re-design of the bus network so that the BRT spine services are fed by ordinary local services. There will be a 30% increase in stop spacing to about 400m between stops. Headways will be 7-8 minutes during the day and 20 minutes later in the day. Delivery is being co-ordinated with other large infrastructure projects. There have been challenges over the re-location of on-street parking and over agreeing the future role of the black cab taxis services which operate as an informal type of public transport. The city centre measures were delivered early as art of a public realm improvement project before the scheme received full approval. This will minimise disruption for city centre businesses. The regulated environment has aided delivery. Click here to download the presentation and the audio file recording for this section. Metrobus is a step change in public transport, which complements rail. It is funded by three funding streams, each of which were derived from successful bids to government. The project is delivering new infrastructure (such as bridges), bus lanes, guided busway and park-and-ride. This includes bus priority lanes on the M32 and better bus stops with real time information. The infrastructure is delivered by councils. Services will be provided by private operators as part of a Quality Partnership Scheme. No operator has yet been announced and no service specification has yet been agreed. The aim is for 100% off-bus ticketing and Euro VI or low emission vehicles. Services will begin in summer 2017. As part of the region’s 2026-36 vision, LRT may be delivered in future. Sprint comprises two routes – on the A456 and A45 – which combine to form a cross-city route. This addresses the lack of cross-city routes in the city and the journey time penalties for city centre interchange. The project does not use guideways but priority is given to buses at junctions. Sprint connects with the Midlands Metro to form a Rapid Transit Network. Sprint vehicles will be designed to closely resemble Metro vehicles. Stops will be limited to 400-800m. Existing bus services on the Sprint routes would be retained but at a lower frequency. The goal is for there to be no premium fares for Sprint. Birmingham faces fines if it does not improve air quality, so TfWM would like to use zero emission vehicles. TfWM is encountering trying to persuade the DfT to accept 24m vehicles, for which it needs derogation from the standards which currently prohibit public transport vehicles of this length. If TfWM are successful, this would amount to a change in UK law. The DfT is concerned about safety and the impact on the wider network, but TfWM is arguing that safety will be ensured because it has designed Sprint for 24m vehicles. Kent Fastrack serves an area with huge development potential. The original vision was for a 45-50km network, half of which was to be segregated. This was a public transport-led vision of new development. In 2006/07 two routes opened. One route was funded entirely be developer contributions from a Section 106; the other route was funded by the public sector. The 2008 recession stopped development entirely. The Ebbsfleet Development Corporation, formed in December 2015, aims to expedite development in Kent Thameside, capitalising on HS1 links. The involvement of the EDC creates challenges because it is another layer of public sector governance. The area is awash with opportunities. Ebbsfleet HS1 station is to be transformed into a mixed use development. There are plans for an international theme park on the Swanscombe Peninsula. Crossrail will be extended to Gravesend. This history of this project reveals the difficulty of maintaining momentum on a BRT scheme if there is a delay in the associated private sector development. Population of Greater Manchester is growing, from 2.4m in 1991 to 2.7m in 2011 to a projected 3m in 2040. This means there will be 300,000 people and 80,000 more jobs. It will be necessary to use road space more efficiently, such as implementing bus lanes on motorways. TfG does not believe it is deriving the full value from the bus system in the absence of regulation. There is over-bussing on certain routes and too few buses on other routes. TfGM supports franchising because it will provide the means to deliver an integrated network with better journey planning a stronger brand, which helps people to understand the buses. Under a franchising regime, TfGM will work with the operators within a single network. John Barry observed that transport planners are mainly working in already developed environments, rather than virgin sites. TfL is focusing on networking reliability and changing the network to respond to new developments by reorganising services. There was a decline in bus patronage in 2015-16. This was greatest in inner boroughs such as Southwark and Tower Hamlets. Using automatic vehicle detection data and ticketing data, TfL has identified a strong correlation between boardings and vehicle speeds. This provides evidence of the need for more bus priority. Bus priority has fallen down the political agenda since the 2000-2005 period; therefore, there is a need to elevate it again. Improved rail and tube services mean fewer people use buses for journeys to central London. This creates a case for some diversion of resources from radial services focused on central London to services focused on areas of housing growth. BRT is less unique in London because all services have many BRT features. East London Transit is a BRT scheme in Barking Riverside. Buses service meet need for east to west movements, while caters for north to south movements. Buses have exclusive access to the town centre. On the Old Kent Road, elements of BRT will be introduced in advance of the Bakerloo extension. TfL considers this worthwhile in the interim period. Bus priority should be seen as an integral part of the Health Streets model, not a threat to it. Buses must compete for space with walking and cycling, now more than ever. BRT can serve areas that are densifying and TfL makes agreements with developers to ensure bus has a place. Connected and Automated Vehicles (CAVs) are vehicles with increasing levels of autonomy, which starts with driver assistance on the motorway and could lead to fully automated taxis and buses. Allan discussed some UK projects on CAV technology. The LUTZ Pathfinder project is a low, speed, low mass pod vehicle which runs on pavements. It is being trialled in Milton Keynes. UK Autodrive is creating a fleet of 40 pods to operate like a public transport fleet. The major barriers to CAVs are technical. There is a lack of verification software and validation software. It is unclear how we should benchmark safety. CAVs must overcome several problematic driving scenarios, such as interacting with vulnerable road users, obeying human instructions given by hand, and coping with environmental conditions such as snow, fog, ice and strong sun. There are also regulatory issues and the need to update infrastructure so it is compatible with CAVs. In semi-automated vehicles, there is a risk of drivers losing attention at critical moments. The cost of updating the fleet is considerable: Boston Consulting estimated that it would add $25,000 to the cost of a vehicle. The social acceptability of CAVs is unclear. Volvo is running a project to test AVs in Gothenburg. For public transport operation, CAVs could have many benefits. Allan presented a case study of introducing CAVs to a medium-sized town. Demand responsive vehicles could be deployed on orbital routes or routes to hospitals, complementing high frequency radial routes. Less challenging corridors are more amenable to transferring from non-CAV to CAV. Allan noted that the DfT is looking for CAV test sites. Mark observed that stakeholders do not always differentiate between greenhouse gas emissions and local air pollution: there is a need to address both problems. Mark discussed the relative costs of different bus types. In 2010/11 a hybrid vehicle cost about 40% more than a diesel. The adoption of hybrids was aided by the Green Bus Fund. The cost of hybrids has not fallen much since 2010/1: there is a still a 30% premium. The cost of a Euro VI diesel is similar to the earlier types of diesel bus but it is more fuel efficient than many hybrids. N0X emissions from Euro Vi diesel buses are very low. Hybrids are less reliable than Euro VI diesels. The Euro VI bus can be a useful tool for improving air quality even though it is not a hybrid or electric vehicle. It is important to note Euro VI have not been nearly as successful as Euro VI buses in reducing emissions. Mark argued that all technologies. Plug-in electric buses with opportunity charging operate in Bristol. Reading Buses have found the biomethane buses to be very successful and popular with passengers. Nottingham Community Transport (NCT) runs tendered services for Nottingham City Council (the buses are owned by the city council). NCT operates 58 Optare, fully electric buses, which operate with an overnight charge and a single rapid charge during the day. NCT is operating new BYD buses which can operate for 12 hours without the need for in-service charging (they require 5 hours of charging overnight). NCT chose electric buses to reduce operating costs without a loss of service in the context of £4m of budget cuts. There was also a desire to improve air quality and reduce noise pollution. The project to deliver electric buses cost £15.1m, funded by Workplace Parking Levy, OLEV, LSTF and the city council. The capital cost of the buses was 100% more than diesel buses. There was also a need to increase the power supply. There were savings in fuel and maintenance. It costs 27p per mile to operate a diesel vehicle, but only 3p per mile for an Optare EV and 11p per mile for BYD. There has been a 33% reduction in carbon emissions in Nottingham, partly due to public transport. NCT has encountered various problems – including the need to move fast chargers, the limited range of Optares, a dip in performance during winter and a tendency for drivers to accelerate too fast – but none of these are significant. Ian advised that operators should think carefully about the type of bus they need and the operating requirements of different models. There was discussion about why Euro Vis are now so efficient. This is linked to better energy recovery and lightweighting. Delegates asked whether level 5 automation will ever be possible? It was considered unlikely that level 5 automation will be possible for several decades. Level 4, which does not require human control in certain areas, is more likely. It was agreed that there is more opportunity for AV technology in public transport. Jeremy reported on the progress of BRT schemes in Cambridgeshire. The Cambridgeshire Guided Busway has broken all its patronage targets. A new town at North Stowe on the route of the busway – which, it was assumed, would open at the same time as the busway – is only now being constructed. A new Cambridge North railway station will be served by a bus-only road. Cambridge and South Cambridgeshire needs 33,000 new homes. The number of people who commute to Cambridge is double the population of the city. The current modal share in the county is unsustainable. Congestion will simply worsen unless it changes. Traffic conditions were stable for twenty years, but now they are worsening. Growth must be catered for by sustainable modes. In order to enable the network to perform as successfully as it does during the school holidays, it would be necessary to reduce commuting by car by 30%. Cambridgeshire is looking at BRT on other radials in Cambridge as part of a comprehensive programme of bus priority. On the A428, bus priority will address 2 miles of queues to the park and ride. West of Cambridge, BRT could support new housing via a BRT route following the M11. A BRT option is being considered for the A1307 Cambridge to Haverhill route. As part of a City Deal, Cambridge is considered a Workplace Parking Levy, peak time road closures to cars, and improvements for public transport and active modes. This is needed to address the congestion on the Hills Road where there are 60-70 buses per hour and a 7 minute journey takes up to 60 minutes. Gwyn noted that the BRT schemes of Latin America were delivered through regulation. Services provided by multiple private operators were franchised to replace the previously chaotic deregulated model. Gwyn argued that franchising will benefit BRT promoters. Adopting franchising powers will be a local decision. This would give local authorities the ability to specify service levels. Franchising would mean there would be no need to “play games” to deliver BRT schemes. It will be possible to co-ordinate the planning of infrastructure and operation. BRT schemes such as Metrobus in Bristol have been hampered by the uncertainty caused by the separation of infrastructure and operation. Issues such as abstracted demand could be addressed more easily. It would be possible to create a single “Overground”-style system. BRT promoters are familiar with many of the goals of the Bus Services Bill, but franchising will allow BRT promoters to do what they have always done more effectively and seamlessly. It will allow the bus to perform as successful as rail has in recent years and enable councils to deliver their ambitions to grow bus patronage. Rachael Skinner’s presentation was designed to challenge the conference to think critically about current trends in transport and how we should respond. Despite the rise of digital and connected technology, movement will remain desirable. There has been no reduction in the desire for movement in recent years. In this context we must prepare for the emergence of a new technology: autonomous vehicles (AVs). Rachael contended that AVs will behave more like public transport because they will work as a system. Sharing and renting of AVs will become more common. The growth of AVs will change how people interact with transport and people’s attitude to sharing. In the near future, settlements will be denser and people will have higher expectations from the places in which they life: they will want more access to goods and services. The danger is that dense settlements will become more hellish. But there is an opportunity to extract more value from urban areas. We can re-shape the urban environment, retrofit suburbs and build denser new towns. Because AVs will behave more like public transport, the issues facing public transport now will become even more pressing: network design, regulation, ownership and density. Rachael believes we must make a choice now in how we react to changes in mobility. First, we can put our heads in the sand and how when we look up things will have improved or stayed much the same. Second we can collaborate now to respond to the challenges, or else other people will make the decision on our behalf. Rachael argued that BRT must change now. We have had driverless trains for 30 years. The driverless bus is being tested and it is desirable. Driverless cars are not the answer to everything. There will be major physical problems is everyone tries to use personal vehicles for their journeys. AV musts could become more responsive to changes on the road and user demands. Delegates asked how the Cambridge BRT schemes were to be funded. The answer was a £1 billion pot, 50% of which came from government. Rachael advised that we should not wait for the DfT to tell us what to do. Nor should we leave decisions to be made solely by commercial operates who tend to focus on the short to medium term profit, not the long term. Part of the discussion centred on franchising. Gwyn argued that franchising functions as a form of partnership and should not be seen as eliminating the private sector contribution. He does not view it as a threat to independent operators.